Sigmax POS-EMC is an exception reporting system that retrieves transaction data generated by POS and converts the data to readable format for hybrid digital event recorder (HDER) to process. 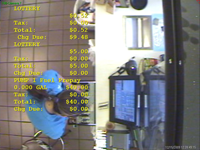 The HDER equipped with text insertion capability overlays the transaction data on video pictures of the check-out area for real-time monitoring. The transaction data along with recorded video, audio (if available) data will also be stored in a database on HDER for later review. With proper deployment of HDER security system, POS-EMC could help stop thefts and frauds related to POS such as under rings, over rings, no rings, substitute scanning, short changing, and pilfering substantially (See Case study or Demo). Alert the store manager as soon as exceptions occurr. Instant review of exception events is only a mouse click away. Exceptions with matched video and audio are archived for later reviewing, printing out, emailing, and/or exporting. Playback archived exception events is fast and easy by choosing pre-defined exception lists, entering conditions (such as NO SALE, VOID, etc.) or any text stream. Real time monitoring or playback archived video via Internet anywhere in the world. Store owners can see all his/her stores in one place.